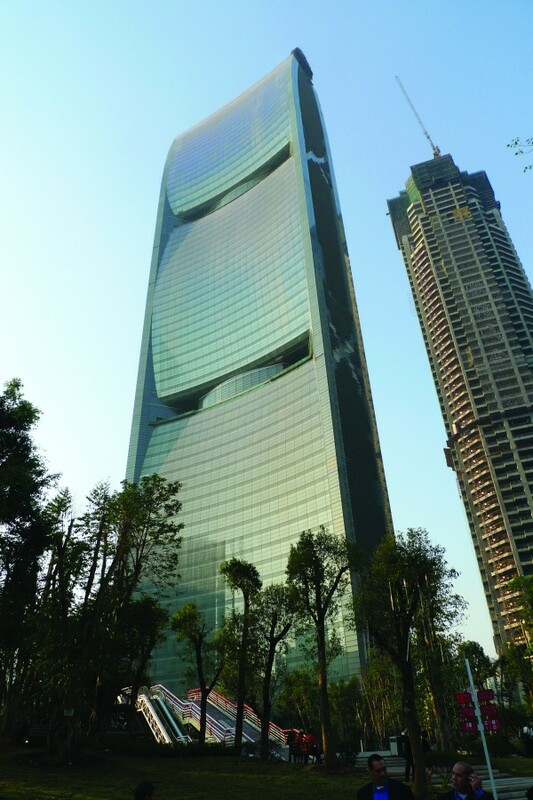 The 309-metre tall, 2.2 million-square foot Pearl River Tower boasts of a high performance façade that generates energy for the tower via building integrated photovoltaics and a subtly sculpted form that drives wind into turbines at accelerated speeds. Its aerodynamic form funnels the wind at high velocity through to four turbine inlets on the façade located on the 25/26th and 49/50th floors. Designed by Gordon Gill in collaboration with Adrian Smith while both were at Skidmore, Owings & Merrill, Pearl River Tower is one ofthe most energy efficient super skyscrapers ever built. These rapid winds will in turn power the integral wind turbines to generate energy for the building’s heating, ventilation and air conditioning systems. A stick façade system is devised around the wind turbine generator tunnel. This super skyscraper contains several other exteriors, including a double-skin curtain wall that is embedded with solar panels to convert the sun’s energy into electricity, and photoelectric sunshades to maximise the natural daylighting.